Project 33: San Francisco-Straße 4 - 6 u.a. 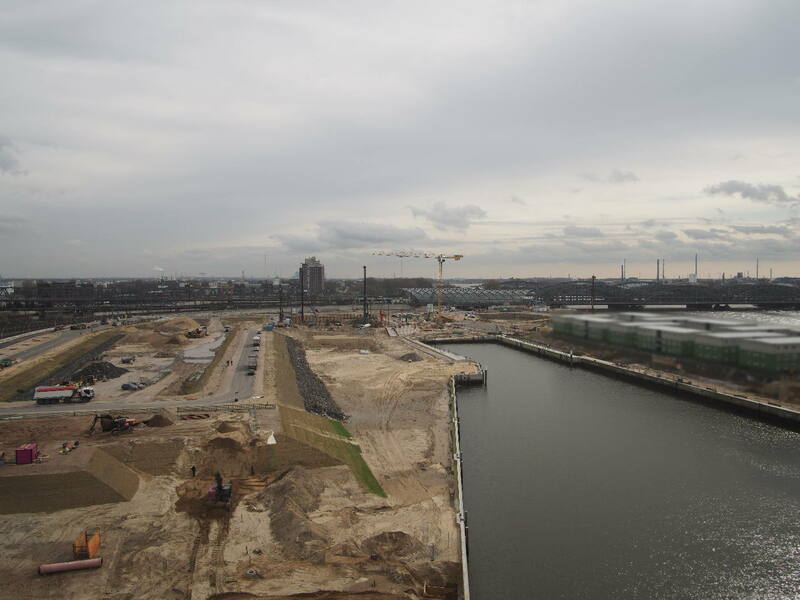 The Am Sandtorpark/Grasbrook neighborhood is HafenCity’s second completed quarter. Located between Sandtorhafen in the west and the lively Überseequartier, this area became not only a popular location for international corporations, but also a comfortable setting for everyday life with an elementary school, many family apartments, and two small parks. The elementary school (29) is certified gold with the HafenCity Ecolabel, and has served as a social hub within the quarter since 2009. The Katharinenschule also features an integrated gymnasium, and is adjacent to a building which houses a day care center with a nursery, as well as 30 apartments. Family-friendly residential buildings in the neighborhood (28a + b) also contribute to this urban area’s social diversity. Since 2013, the 7,100-m² Grasbrookpark, with its many play facilities – which have been co-created by children – has constituted the southern intersection to the neighboring quarter of Strandkai. The most recently completed project at Grasbrookpark also focuses on residential development. 135 apartments were built directly beside Grasbrookpark according to plans drawn up by the architectural firm BKK-3 (Vienna). Cooperative apartments, subsidized public housing, studios, student residences, a daycare center, and other sites for retail purposes were among the units built. But the quarter is also characterized overall by its unique international feel and its many enterprises. The renowned architect Richard Meier designed the Hamburg-America-Center, where Amerikazentrum Hamburg e. V. organizes a varied cultural events program. The Buss Group has used the largest area of the office building directly bordering Sandtorpark as their headquarters since fall 2011. Since the end of 2017, the bianc restaurant run by top chef Matteo Ferrantino has been one of HafenCity’s many gastronomic highlights. The three buildings of the neighboring International Coffee Plaza were also designed by Richard Meier, a previous winner of the Pritzker Architecture Prize. The buildings were developed by the entrepreneurial Neumann family, whose company group of the same name can be found in the widely visible, 13-story Ellipsenturm, one of the main architectural landmarks in the quarter. The German headquarters of the shipping company Eukor are also located here. Two other large buildings directly bordering Sandtorpark offer even more space for companies. The distinctive SKAI office block, which covers 16,000 m² GFA and features an eye-catching façade made up of copper elements, has occupied the space north of the park since 2009. Its plans were drawn up by the Hamburg-based architects Böge Lindner. To the south of Sandtorpark lies the Centurion Commercial Center (14,600 m² GFA), which has been awarded the gold HafenCity Ecolabel, and which is a hub for the cruise industry, eateries, and retail stores on the ground floor. Further south on Grosser Grasbrook, Kühne Logistics University (KLU) and Medical School Hamburg (MSH) moved into the former SAP building in Autumn 2013. The headquarters of the logistics company Kühne + Nagel has occupied the plot directly beside it since 2006.